The gun goes off as the start of the girl's 3A state race is initiated. Detweiller Park, Saturday Nov 4, 2018. After three extra weeks of hard work and extra miles, the York Girls Varsity cross country team had a fantastic end to their season at the 3A state meet. The team was represented by top-seven runners senior Sarah May, juniors Emma Kern, Lydia Hickey and Grace Moriarty, and freshmen Katelyn Winton, Katelyn Leonard, and Kathleen Buhrfiend. Continuing their practice and travelling down state as well were alternates senior Anna Morley, juniors Maggie Clink and Maya Curry, and freshmen Allison Fitzgibbons, Anna Clink and Erin Powers. The York athletes not only made the school, but the entire community proud. 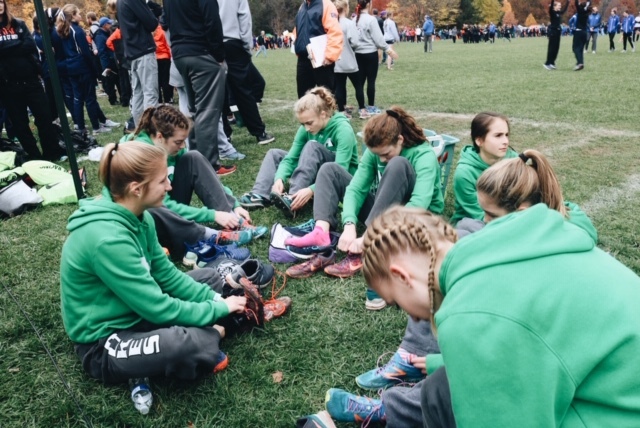 The varsity team competed against a plethora of tough teams at their regional meet on Saturday October 20th hosted at Lake Park. 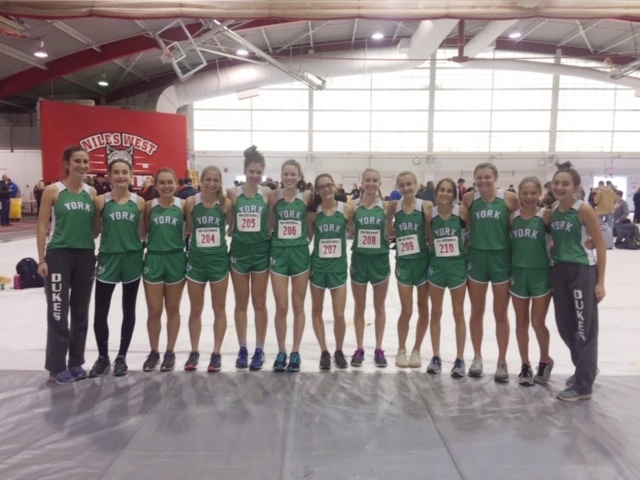 The girls competed fiercely with exceptional performances by senior Sarah May who placed 4th overall with a time of 17:41.6, and Lydia Hickey who placed 8th overall with a time of 18:14.1. The Dukes came out on top and placed 2nd as a team, beating their rivals Glenbard West for the first time in 6 years. The Girl’s XC team share smiles after competing in the regional meet at Lake Park finishing second. The following weekend the Dukes took on 18 teams at the Niles West Sectional. The athletes placed third in the sectional beating Glenbard West yet again, instantly qualifying them for state. All thanks to outstanding races from junior Emma Kern who ran a personal best of 18:23.92, and freshman Katelyn Winton who ran her personal best as well, 18:25.44. The Dukes gather together after competing in the Niles West Sectional meet, placing 3rd and qualifying them for the state meet. The first Saturday in November and the Dukes were ready to toe the line at the infamous Detweiller Park in Peoria, Illinois. Conditions were looking good for the girls as they were placed in box 32 close to the outside (runners prefer to be on the ends as it is easier to get out), the weather was seemingly perfect with a temperature of 52 and clouds in the sky, which had the team feeling excited, confident, and prepared to race. 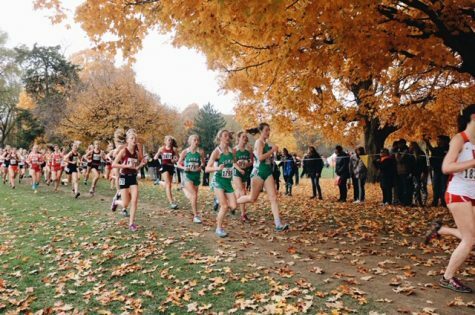 The girls were focused on running as a pack, keeping their champion mindsets in place, and getting out confident in the beginning. The varsity team spike up for their competition at the state meet. A long whistle rang out throughout the park and 220 athletes and 25 teams took their place on the line, then “BANG” the gun went off and a second later the wave of racers made their way down the first stretch of the race. The first mile goes by fast and the crowd follows the racers across the course wherever they go shouting and cheering. Senior Sarah May flies by the mile and then a pack of green is spotted with freshman Katelyn Winton, and juniors Emma Kern, Grace Moriarty and Lydia Hickey racing all together. Not far behind them, freshmen Katelyn Leonard and Kathleen Buhrfiend race past also upholding their goal of sticking together. 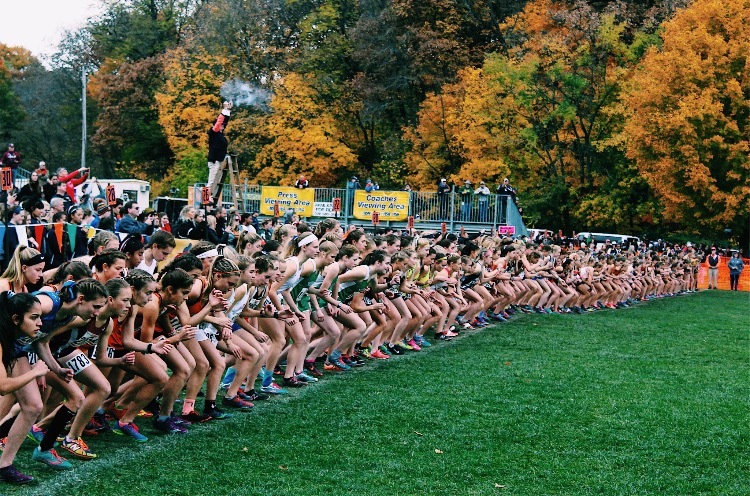 The gun goes off as the start of the girl’s 3A state race is initiated. Detweiller Park, Saturday Nov 4, 2018. The Dukes- Emma Kern, Lydia Hickey, Katelyn Winton and Grace Moriarty run together as a pack past the first mile marker. Many students and cross country team members took the long drive down to Peoria this year to cheer on and support their team one last time. 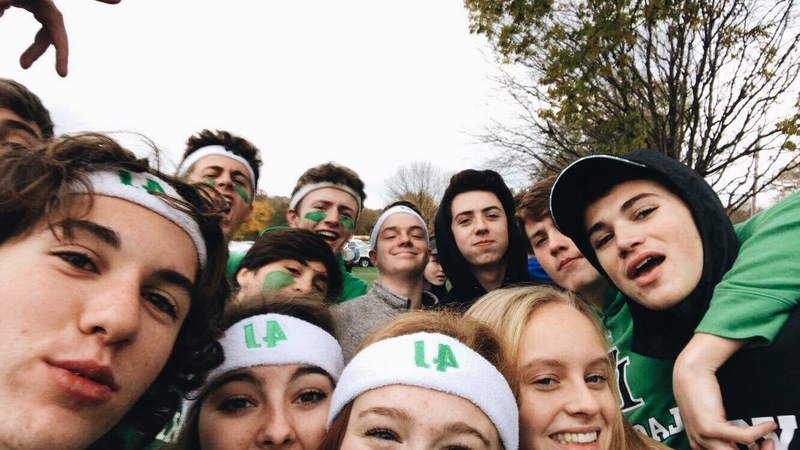 “The state meet is overall an awesome experience, it really embodies the definition of school spirit, and it’s super fun taking the long drive down with friends to cheer on the runners and this year we did a tailgate before the races with members from both the boys and girls team which was different and really cool,” junior and member of the girl’s team Elly Fitzgerald said. “Overall I am so proud of the girl’s who ran because I know they worked so hard to get there and watching them cross the finish line made me so proud to be a part of the girl’s cross country team,” Fitzgerald said. Junior Elly Fitzgerald and friends pose for a selfie as they cheer on the boys and girls teams racing in the state meet. 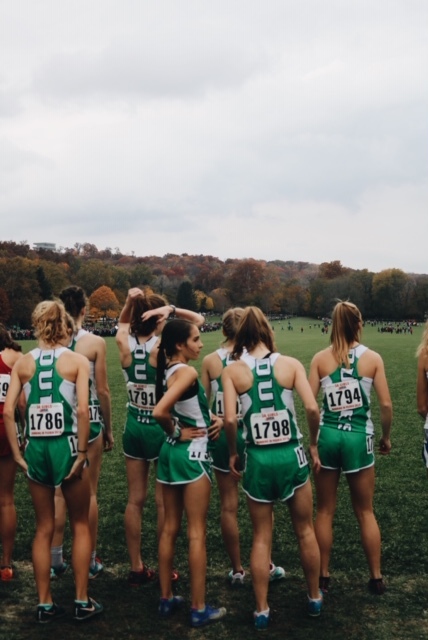 The Dukes continued racing strongly and fearlessly as they finished with six out of the seven girls running their personal best and overall placing significantly better than they have in the past 5 years with 413 points, resulting in a 16th place finish. Senior Sarah May placed 31st with a time of 17:15.76, junior Emma Kern ran an 18:16.49, freshman Katelyn Winton an 18:18.44 right alongside junior Grace Moriarty with an 18:18.49. Junior Lydia Hickey ran an 18:36.64, freshman Katelyn Leonard an 18:38.35, and last but not least, freshman Kathleen Buhrfiend raced an 18:41.05. The girls have proven that they have the strength and capability to compete and to do it with grit and tenacity, we are so excited to see what this team will bring to the courses next season. The varsity team toes the line at Detweiller park, Nov 4, 2018. 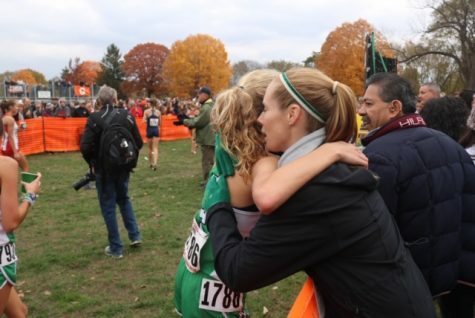 Freshman Kathleen Buhrfiend and head coach Lauren DeAngelis embrace after the end of the race. Detweiller Park, Nov 4, 2018.